A Syrian passport found outside the Stade de France on Friday night after the first explosion that led to a trail of violence in multiple attacks around Paris was traced to refugees who passed through Greece. The Greek Ministry of Public Order had noted that the passport owner had traveled through Leros on October 3 and had been registered according to the guidelines of the EU as these had been decided at the EU Council on refugees. 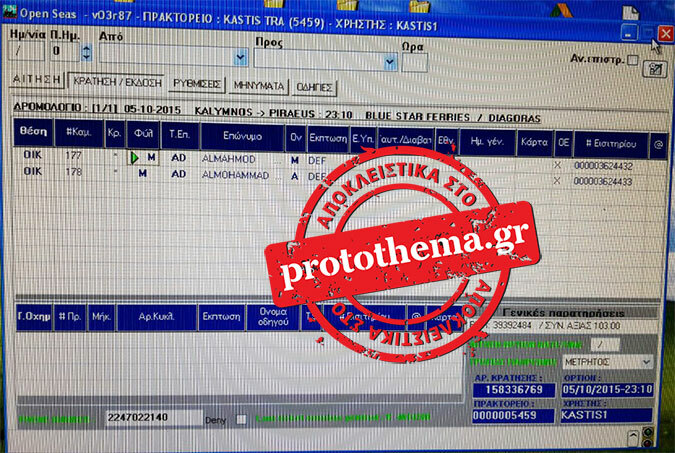 In an exclusive, protothema.gr has released the names of the two migrants involved in the terror attack that had passed through Greece on October 3 – Ahmed Almuhamed and Mohammed Almuhamed. They came to the island of Leros and stayed from October 3-4 where they were documented. On October 5 they used their Syrian passports to travel to Piraeus via Kalymnos on Diagoras. Just 39 days later on Friday, November 13, they were outside the Stade de France game at 9.30 p.m. where the first “kamikazi” bomber who had explosives tied to him carried out the first attack in the name of the Islamic State. The suicide bombing took place at the stadium where 80,000 people had gathered to watch the friendly game between France and Germany. Among the spectators was French President Francois Hollande and German Foreign Minister Frank-Walter Steinmeier. The two men traveled using Syrian passports and are believed to have been involved in the bloodshed at the Paris capital that cost more than 127 lives. Why are you Greeks letting all of these "refugees" into your country. Do you not care about your culture at all? How can you tell that if those "refugees" are real refugees or "refugees"? Problem is on Turkey's side really. They smuggle them. They let smugglers push people into Greek borders. Greek authorities are obliged to save them since are sinking in water and their life in danger. Do you have any solution to that???? They even carry fake passports. WHO IS GIVING THEM THOSE PASSPORTS?? HINT: THEY GET THEM IN TURKEY. Συγγνώμη αφού αποδείχθηκε πως το διαβατήριο ήταν πλαστό. Δεν αντιστοιχεί σε κάποιο Σύριο πολίτη....και εκτός αυτού πόσο πιθανό είναι να ανατιναχθει κάποιος και να μην διαλυθεί το διαβατήριο. ..
οτι και να σου πουν εσενα...? ?εχεις προβλημα ψυχολογικο Η ΚΑΤΙ ΑΛΛΟ...οποτε....? ?